Summary: Good book. Scary premise. Hope he’s wrong. asserts that technological improvements are going to lead to mass unemployment. He believes that many of the routine jobs people currently do will soon be done by machines. By soon, he seems to mean the next 10 to 50 years, depending on the work in question. 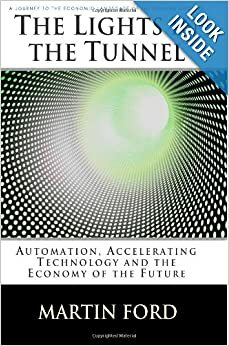 His thesis is in direct contradiction to the standard economists’ view that technology has generally created more employment opportunities within a society and always will. Ford believes that though in the past, this may have been true, this trend is ending. The jobs he believes could be lost to automation include truck drivers and deliverymen, store clerks, cashiers and stock boys. He believes much of the routine work of more intellectual jobs, like lawyers and software engineers, could also be automated in the near future. He has some good points. My local grocery store, Shoppers, has installed 4 self check out machines. I don’t know if the machines are meant to supplement existing cashiers or replace them. Perhaps the company didn’t know either when they installed them. The machines are certainly useful when one only has a few items. And they’re buggy enough that they still need a employee to hover nearby to troubleshoot. So perhaps the machines haven’t replaced any workers. However, I have noticed that on weekday mornings Shoppers often doesn’t not have a regular checkout aisle staffed. Only the 10 item or less item is manned. I’ve written several complaints to Shoppers about this, but to no avail. I haven’t seen any robot shelvers yet. I don’t know if that’s a reasonable idea or not. Ford notes that a grocery store or big box store are an ideal environment for robots. The aisles are wide and the floor is smooth. All the products already have UPC codes on them for tracking and RFID tags are getting cheaper. That all sounds good. Still, the image of a machine stocking shelves seems so science fiction-y. Ford notes, that from an employer perspective, people are expensive. Computers and robots don’t need sick leave, lunch breaks or health insurance. Machines don’t have disputes with other workers, don’t harass others and don’t charge the company with permitting a hostile work environment. The don’t whine about more work for the same pay. His point with this is that employers have a strong incentive to automate if they can. And, Martin asserts, with robotics and sophisticated software becoming less expensive and more capable, an increasing number of firms will be able to automate their routine operations. One thing I like about Ford’s book is that he focuses on the average man. Too many of these societal trend books, especially those about technology, address the concerns of the upper middle class. I’m talking about you Don Tapscott. Oh, we’re all going to work from home! Displaced factory workers can all become web masters with the right training. There’s none of this utopian foolishness in Ford’s book. The jobs he’s concerned about are those held by the average American. Ford acknowledges that there are jobs beyond the capabilities of an average person. He notes that the idea of retraining workers unfairly places the blame for their displacement by technology on their own shoulders. Well, if you’d only gone to college like us smart people, you wouldn’t be in this mess would you loser! He has a table on page 59 of his book laying the number of workers in different types of jobs. Following a discussion of how automation might impact cashiers, retail salesmen and others, he summarizes the problem for these folks and us. I certainly see how automation has impacted reference librarians. The Internet has virtually eliminated ready reference questions. I remember ready references exercises in library school – thanks Dr. White – but I almost never get such questions in the real world. I’ve probably had no more than 10, if that, in my almost 6 years working at the public library. I had more at Georgetown, but those were very obscure ones that did not lend themselves to Google. Often they were research papers disguised as “simple” factual questions. Stuff like what’s the literacy rate of the Hutu minority in Egypt. Ford’s solution to the problem is for us to start decoupling income from jobs. Basically, everyone should get a guaranteed minimum income. This will keep every fed and maintain the consumption of goods upon which our economy depends. Good luck with that dude. We can’t even simplify the tax code. This entry was posted in Uncategorized and tagged automation, economics, futurism, obsolescence, robots, technology, unemployment, United States, work, workplace. Bookmark the permalink. Thanks for summarizing because I think this would be too stressful of a read for me. 🙂 Real life is anxiety-provoking enough. You’re welcome. We live to serve!